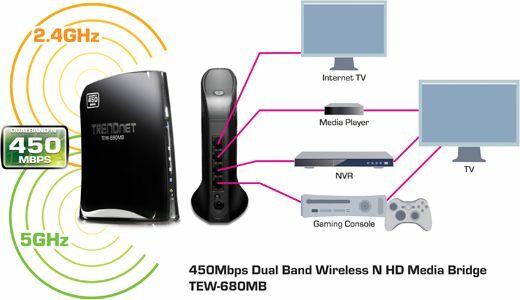 TORRANCE, Calif.–October 27, 2011– TRENDnet, a best-in-class wired and wireless networking hardware brand, today announces the availability of the first to market 450Mbps Dual Band Wireless NHD Media Bridge, model TEW-680MB. With the proliferation of streaming HD video over the Internet into the home, wireless network loading has never been greater. TRENDnet’s TEW-680MB provides the highest wireless connection speeds available for up to four media center devices such as media players, gaming consoles, Internet televisions, and NVRs. This high performance product helps ensure that the wireless component of an overall network does not produce lag or jitter when wirelessly streaming HD movies and more to a media center. Dual Band technology provides the option of connecting either over the common 2.4 GHz wireless network or over the low interference 5 GHz network. A popular network configuration when connecting to a Dual Band router is to dedicate the router’s 5 GHz band to the TEW-680MB and the 2.4 GHz band to laptops and mobile devices. The TEW-680MB needs to be connected to a 450Mbps router, such as TRENDnet’s TEW-692GR, in order to maintain 450Mbps wireless speeds. If the TEW-680MB is connected to a 300Mbps router, the router will bottleneck wireless speeds at 300Mbps. An external Wi-Fi Protected Setup or WPS button connects the TEW-680MB to a router at the touch of a button. Gone are the days of entering complicated encryption codes; simply press the WPS button on your router (such as TRENDnet’s TEW-692GR) and then press the WPS button on the TEW-680MB. The devices will automatically exchange information and connect over a secure encrypted wireless signal. WMM® Quality of Service (QoS) technology further prioritizes streaming video, gaming, and Internet calls. Connect up to four devices to the four Gigabit Ethernet ports on the back of the TEW-680MB. LEDs on the front of the wireless bridge convey device status. The 450Mbps Dual Band Wireless N HD Media Bridge, model TEW-680MB, comes with a three year limited warranty and is currently shipping to TRENDnet’s online and retail partners. This is good stuff. Is it ok if I pick some content up from here for my blog? Do you have any reservations? Or terms?